Double-stranded RNA (dsRNA)-mediated interference, or RNAi, has emerged as an effective technique to phenocopy the loss of function of a given gene product. With this tool researchers can study the functions of individual molecules in living cells and elucidate the mechanisms that regulate cell division. For example, many molecules that are important for regulating mitosis and for controlling the assembly of the mitotic spindle are mutated in different cancer cell types (for a review, see ref. 1). Functional analysis in vivo of molecules that play a role in mitosis is best implemented by a genetic analysis. For this, genetically malleable organisms such as Drosophila, Caenorhabditis elegans, yeast, and other micro-organisms have been extremely useful. Whereas genetic analysis usually requires a long-term effort, RNAi provides a rapid method for the reverse genetic analysis of gene product function and can be exploited to great advantage. In the era of sequenced genomes, this technique provides a valuable tool for functional genomics. Here, a detailed procedure for RNAi in Drosophila cells in culture is presented. RNA interference was first described using C. elegans (2), although the phenomenon has been described in plants as posttranscriptional gene silencing (PTGS) (3) and as "quelling" in Neurospora (4). Furthermore, RNAi has been demonstrated on a number of organisms (2-9). 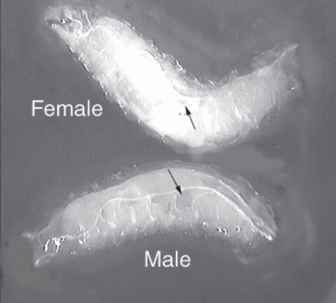 For Drosophila, RNAi has been accomplished by injection of dsRNA into early syncytial cleavage stage embryos (6). Subsequently, heritable RNAi has been achieved in C. elegans and Drosophila using transgenic dsRNA "hairpin"-generating constructs (10-13). An important advance came when RNAi was demonstrated with cultured Droso-phila cells (7). More recently, RNAi has been applied successfully to vertebrate cells in culture using short interfering RNAs (siRNAs) (14,15). For this, the first step in the cellular response mechanism to dsRNA (see below) has to be bypassed, because full-length dsRNAs produce nonspecific effects in vertebrate cells (16-19). RNAi-mediated interference occurs by a posttranscriptional mechanism that targets mRNA homologous to the dsRNA that is introduced for destruction (for reviews, see refs. 20-22). Using Drosophila embryo and S2 cell extracts, the mechanisms for RNAi are being elucidated (16,23). In these extracts, dsRNA is cleaved into 21- to 25-bp siRNAs with 5' phosphates, 3' hydroxyl groups, and contain two to three nucleotide 3' overhangs. dsRNA cleavage is mediated by Dicer, an ATP-dependent RNaseIII family RNase (24). siRNAs assemble into an approx 360-kDa complex called RNA-induced silencing complex (RISC) in Drosophila extracts (25). The siRNAs then unwind in an ATP-dependent manner (23,25). The single-stranded siRNAs in the RISC complex provide the homologous targeting to mRNA (23,26), enabling degradation by the RNase associated with RISC. Furthermore, Argonaute proteins are components of RISC (27) with homologs in plants, fungi, and C. elegans that are required for RNAi in those organisms (28-30). The degraded target mRNA appears to then be cycled into new siRNAs that repeat the process in an RNA polymerase-dependent cycle of mRNA degradation and siRNA production (31). The complete mechanism for RNAi has not been elucidated. A teleological explanation for the existence of a mechanism to destroy mRNAs in response to homologous dsRNA has been proposed (32). It has been suggested that RNAi evolved as a mechanism to combat invading dsRNA viruses or to inhibit the activity of retrotransposons. Moreover, there is at least one gene in Drosophila, Stellate, that is regulated by dsRNA-mediated gene silencing in the testis (33). This chapter describes the application of RNAi to cultured Drosophila cells, with a particular emphasis on the imaging of the cytoskeleton and chromosomes in affected cells. Materials and methods are provided to enable the researcher to implement the design and production of dsRNA from polymerase chain reaction (PCR) templates, the culture of Drosophila cells and their treatment by RNAi, the analysis of target protein depletion by Western blotting, and the fixation and treatment of cells for microscopic imaging. The depletion of centrosomin (Cnn) a centrosomal protein that is required for mitotic centrosome assembly and function (34-37) from S2 cells is presented for example, but the technique is widely applicable to different targets and cell lines (7,17,38). Importantly, Drosophila cells in culture readily take up exogenous dsRNA, and there is no need to use carriers or transfection methods like those required with mammalian cell culture (7). Thus, RNAi holds great promise for the analysis of protein function in living cells. 1. Oligonucleotide primers for PCR. 2. Thermostable DNA polymerase (e.g., Clontech Advantage2 PCR reagent). 3. 10X buffer for PCR. 4. 10X Deoxyribonucleotide triphosphate (dNTP) mixture (solution containing 2 mM each of dATP, dGTP, dCTP, and dTTP). 5. PCR purification kit (Qiagen). 2. Ambion MEGAscript T7 kit (cat no. 1334), or Promega Ribomax large-scale RNA Production System-T7 (cat. no. P1300). 1. Live culture of Drosophila S2 cells (ATCC CRL-1963). 2. 100 x 20-mm cell culture dishes. 3. Sterile 15- or 50-mL conical centrifuge tubes. 4. Fetal bovine serum (FBS) (Hyclone or GIBCO). Heat treat at 65°C for 30 min prior to use (see Note 1). 5. Culture medium: M3 + BPYE (Bacto-peptone, yeast extract). Per liter: Mix 39.4 g Shields and Sang M3 powder (Sigma-Adrich) and 0.5 g KHCO3 into 800 mL deionized water. Mix until dissolved, then bring pH to 6.6 with HCl. Add 1 g Yeastolate (yeast extract, cell culture grade; Sigma-Aldrich), 2.5 g Bacto-pep-tone and deionized water to a final volume of 1 L. Filter sterilize; store at 4°C (see Note 2). 7. Multiple well flat-bottomed Cluster-6 plates, or 60-mm culture dishes. 1. 30:0.8 Acrylamide : bisacrylamide. 5. 25% Ammonium persulfate (APS) (store at 4°C for up to 1 mo). 7. Protein minigel apparatus (e.g., Bio-Rad Protean system). 8. Gel transfer apparatus (e.g., Bio-Rad minigel transfer system). 9. SDS-polyacrylamide gel electrophoresis (SDS-PAGE) electrophoresis buffer: 25 mM Tris base, 192 mM glycine, 0.1% SDS. 10. 5X SDS-PAGE loading buffer: 350 mMTris-HCl, pH 6.8, 25% glycerol, 2% SDS, 5% 2-mercaptoethanol, 0.01% bromophenol blue. 11. Gel transfer buffer: 25 mM Tris base, 192 mM glycine, 20% methanol. 12. TBS-T: 50 mM Tris-HCl, pH 7.2, 120 mM NaCl, 0.1% Tween-20, autoclaved. 13. Blocking Solution: 5% Nonfat dry milk in TBS-T.
14. Horseradish peroxidase (HRP)-conjugated secondary antibody (Jackson IRL). 15. Chemiluminescence detection reagent (ECL, Amersham, or Supersignal West Pico, Pierce). 1. Glass slides (untreated) with approx 10-mm-diameter wells (e.g., Fisher cat. no. 12-568-20, or PGC Scientifics cat. no. 60-5453-24). 3. Humid chamber for slides. 4. Poly-L-lysine solution (MW > 300,000, Sigma-Aldrich P1524), 1 mg/mL. 5. 10X Phosphate-buffered saline (PBS): 18.6 mM NaH2PO4, 84.1 mM Na2HPO4, 1.75 M NaCl, pH 7.4. 6. PBS: Dilute 10X PBS stock to 1X with water. 7. 10% Solution of saponin (Sigma-Aldrich). Store aliquots at -20°C. 8. 100 mg/mL bovine serum albumin (BSA, fraction V) in PBS + 0.02% solium azide. Store at 4°C. 10. Primary antibodies (e.g., anti-a-tubulin mouse monoclonal DM1A [Sigma-Aldrich]). 11. DAPI (4', 6-diamidine-2'-phenylindole) or TOTO-3 DNA dye (Molecular Probes). 12. Fluorescent secondary antibodies (e.g., fluorescein isothiocyanate [FITC]-conjugated donkey anti-mouse [Jackson ImmunoResearch Laboratories]). 1. Mountant: 0.05% p-Phenylenediamine, 0.1 M Tris, pH 8.8 in 90% glycerol. Store at -20°C shielded from light. Solution will turn brown over time. Make fresh every 6 mo. 2. Microscope with 600-1000x magnification (confocal microscope is preferred). 3. Filter sets for FITC, tetramethylrhodamine (TRITC) (or Cy3 or Texas Red), and Cy5 (for TOTO-3) (see Note 3). 1. Design oligo. Oligonucleotides should be designed against cDNA or exon sequences of the gene of choice, preceded by the T7 promoter sequence: TAATACGACTCACTATAGGGA (the underlined G is the transcription start site for T7 polymerase) (Fig. 1A). Design primers to produce templates of 7001000 bp in length, although shorter dsRNAs also appear to work (17). In general, the target sequence of the primer should be 18-24 nucleotides in length. Programs such as Oligo (Molecular Biology Insights), MacVector (Oxford Molecular Group), or Primer3 (free on the WWW) (39) can be used to design primers that fit guidelines for PCR effectiveness such as GC content and predicted Tm. 2. Amplify template by PCR. Mix: In a 0.5 mL tube mix 10 |L Advantage 2 PCR reagent (Clontech), 10 |L of 2 mM dNTP mix, 0.2 |M each primer, 50 ng cDNA or 1 |g of genomic DNA, and water to a final volume of 100 |L (see Note 4). Amplify in a thermal cycler for 30 cycles: 94°C for 30 s, 55°C for 30 s, 72°C for 1 min. 3. Analyze 5 |L of the reaction by agarose gel electrophoresis. The PCR product should appear as a single band of the expected size on the gel (see Note 5 and Fig. 1B). 4. Purify the PCR product using a PCR purification kit (Qiagen). Collect the DNA in RNase-free water (included in Ambion MEGAscript kit) (see Note 6). 5. Quantify the PCR product using a spectrophotometer or by using the ethidium bromide spot method (40). 6. Adjust the concentration of PCR DNA to 0.1 |g/|L with RNase-free water. 1. Mix 10 |L PCR DNA (1-2 |g), 16 |L nucleotide triphosphate mix, 6 |L RNase-free water, 4 ||L of 10X reaction buffer, and 4 |L enzyme mix in a 0.5- or 1.5-mL tube to a final volume of 40 | L.
4. Precipitate RNA: add 50 |L RNase-free water, 10 |L 3.0 Msodium acetate pH 5.2, 250 |L 95% ethanol, and place at -20°C for >15 min. 5. Centrifuge for 15 min in microfuge at 4°C. Discard the supernatant. 6. Wash the pellet with 1 mL ice-cold 70% ethanol, centrifuge for 5 min. 7. Remove as much of the wash solution as possible and suspend the pellet in 100 |L RNase-free water. Perform this and subsequent handling of the dsRNA in a sterile hood. Repeated vortexing may be necessary to dissolve the RNA pellet. 8. Quantify the RNA concentration by ultraviolet (UV) absorbance with a spectrophotometer. Begin by diluting your samples 1:100-1:200 to obtain a reading in the linear range. To calculate yield, assume 1 A260 unit corresponds to 40 | g/mL [A26o x dilution factor x 40 = |g/mL dsRNA]. 9. Analyze the integrity of dsRNA by agarose gel electrophoresis of the sample (3-5 |g). 10. Store the dsRNA solution at -20°C. 1. Culture S2 cells to a density of 0.5-1.0 x 106 cells/mL in 100-mm dishes, 6-7 mL of culture per dish. 2. Suspend the cells by gently pipetting with a 10-mL pipet and transfer to a 15-mL conical tube. If using serum-free medium, suspend cells and skip to step 8. 3. Centrifuge for 2 min at 2000 rpm in a clinical centrifuge. Fig. 1. 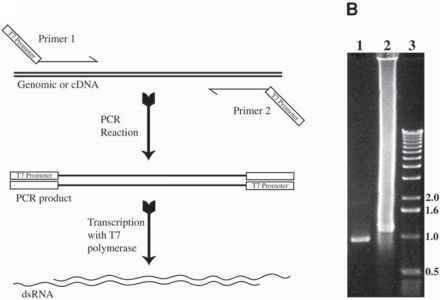 Polymerase chain reaction (PCR) template DNA and dsRNA. (A) Diagram illustrating the scheme for producing T7 promoter-flanked templates by PCR. In panel 1, primers, designed with T7 promoter sequences at their 5' ends, are used to amplify a DNA fragment from genomic or cDNA sources. Panel 2 shows the PCR product, with the T7 promoter flanks, to be used for transcription of dsRNA by T7 RNA polymerase. Panel 3 illustrates the dsRNA product that is produced from the transcription of both strands of the template drawn in panel 2. (B) PCR amplification of a 938-bp segment of cnn cDNA with T7 flanking sequences (lane 1). Transcription from the PCR fragment with T7 polymerase yields a double-stranded RNA product that migrates slower on a gel than the double-stranded DNA template (lane 2). The sample in lane 2 was treated with DNase I prior to loading. dsRNA samples typically produce a smear on an agarose gel like that shown in lane 2. DNA size markers (1-kb ladder) are shown in lane 3. 4. Suspend the cells in 10 mL of serum-free medium (M3+BPYE). 5. Centrifuge for 2 min at 650g in a clinical centrifuge. 7. Suspend the cells in 10 mL of serum-free medium. 8. Add 1 mL of cells into each well of a six-well cluster dish, or into a 60-mm culture dish (see Note 8). Alternatively, use 12-well dishes with 0.5 mL culture per well. 9. Add dsRNA to a final concentration of 40 nM (see Note 9) and mix well by swirling. 10. Incubate the cells and dsRNA for 1 h at room temperature. Fig. 2. Time-course of Cnn protein levels following RNAi treatment. Protein samples were collected from control RNAi (A) and Cnn RNAi (B) S2 cells at 24-h time-points: d 0, lanes 1 and 8; d 1, lanes 2 and 9; d 2, lanes 3 and 10; d 3, lanes 4 and 11; d 4, lanes 5 and 12; d 5, lanes 6 and 13; d 7, lanes 7 and 14. No sample was collected on d 6. Prestained protein size markers (Bio-Rad Kaleidoscope) were loaded in the lane labeled M and are (from the top) 200 kDa, 120 kDa, 85 kDa, and 45 kDa. Lysate from approx 2.5 x 105 cells were loaded into each lane. Samples were elec-trophoresed on a single 7% sodium dodecyl sulfate-polyacrylamide gel electrophoresis (SDS-PAGE) minigel using the Bio-Rad Protean II system and a 15-well comb. The blot was probed with anti-Cnn and anti-a-tubulin antibodies (as a loading control). Cnn levels dropped perceptibly in the first 24 h and continued to drop until d 5, when the levels appear to rise again. By d 7, Cnn levels still had not returned to normal. 11. Add 2 mL of medium with serum (M3 + BPYE + 10% FBS). Skip this step if using serum-free medium. 12. Examine cells daily. Passage as needed to maintain 30-80% confluence until d 4-9. 13. Wait an appropriate amount of time to examine the cells, which should be determined empirically in a time-course assay for each protein to be targeted (see Note 10 and Fig. 2).